There is nothing that my Little Dude loves more than art. Our art drawers are full of markers and crayons of every color. We have colored construction paper, a 500 sheet pack of white paper, a drawer full of coloring books and stencils. Everything fits in the drawers if I can keep it all organized. Even when organized, the supplies still spill out onto the table and floor next to those white drawers. As much as I hate clutter, every single one of those supplies are used. It is probably the only pile of clutter in this tiny house that I can deal with. My MIL realizes that both of my kids love to color and create, but Little Dude has the most love and passion for those activities. Every Sunday when we go to visit my in-laws, she has some project for them to do. Sometimes it involved glue and glitter, which unfortunately always come home with us. Other times it's simple coloring projects. Yesterday was one of those simple coloring project days. She bought each of our kids a wooden sign that can be colored or painted. At the time I was eternally grateful that she chose markers instead of paint. I must admit I am getting kind of tired of scrubbing paint out of the boy's jeans! 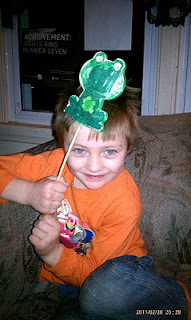 Of the wooden signs, Little Dude chose to color the frog. My boy definitely knows that most frogs are green. He colored every inch of that frog green. Front and back. He is always very proud of his creations, as he should be. He loved this frog so much that he decided to give it a kiss in the car on the way home. I had to stop at the grocery store on the way home and I won't even begin to explain some of the looks I received regarding my boy's face! This was taken after his faced had been scrubbed. Most of the green came off, but there's still some on his upper lip. He is still quite proud of his creation. Again, he did a good job so he should be. 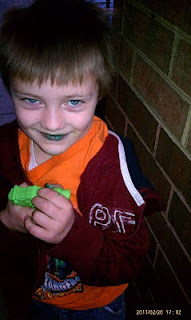 But I'm not looking forward to explaining to his teacher why he looks like he's wearing green lipstick! your little dude seems so adorable to me. It would have been perfect for St. Pat's next month! Ha! That is too funny!! I bet people were totally baffled trying to figure out why his lips were green. 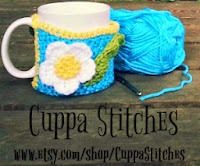 I love projects that turn your mouth colors. I hope you have a great Monday! Holy LOL to his green frog-kissing lips! Oh, the memories this picture will always bring up now. I love it when this happens, a typical day becomes special. Oh Evonne, Lil Dude is PERFECT green lips and all! If you were in NYC or LA no one would think anything of it seriously. My lil guy hung out with some one elses child who was severely autistic with ADHD and the boy spray painted my lil guy metalic silver so he looked like the tin man. And of course both our kids got a hold of markers and such and decided to make themselves the art projects. Thank God for stuff being washable. My suggestion for paint products with your kids would be either Elmers or Crayola, they have the best stuff and it seems to be the easiest to wash out of clothing.